I mentioned that a couple of years back I was having a conversation with a co-worker of mine and she gave me 2 suggestions of places that I absolutely must try if I ever headed to Portland. Ever since that conversation, I’d always kept these 2 eateries in mind knowing that one day I’d make it to Portland. The first place she suggested was Voodoo Doughnut, which my husband and I tried and enjoyed. Tough a bit touristy, my husband pointed out that we were tourists and it’s the tourist thing to do. The second place my co-worker recommended was an ice cream shop that was particularly well known in Portland. I remember after we had that conversation, I checked out this ice cream shop’s website because it sounded so interesting. I discovered that, at the time, the ice cream shop had just announced plans to expand beyond Portland and open up a store in Los Angeles. A few months after this conversation, my husband forwarded me a link to a listing of the world’s 30 best ice cream parlors, and this particular ice cream shop was on that list. That’s when I knew I had to remember this place because whenever I made it to Portland, I was going to have to make it a point to stop and try some of their ice cream. You all know how obsessed I am with ice cream, so it would be impossible for me to go to Portland and not try this ice cream. Salt & Straw is the story of a woman who had a long time dream of opening an ice cream scoop shop, but always lived her life in the safe lane. That is, until she decided to cash in her 401(k), move back to Portland, and move forward with throwing everything she had into this idea of creating fun, unique, interesting and creative ice cream flavors that also incorporated and highlighted every culinary aspect that was uniquely Portland or Oregon. Soon, she reconnected with her cousin who was just about to start a culinary career after having traveled around Asia while studying abroad. After several conversations and their realization that they were headed in the same direction with their life goals, the cousin moved from Seattle to Portland and the next day became Salt & Straw’s head ice cream maker. Today, the culinary talents, and unique ideas of these two cousins has seen Salt & Straw expand from a brick-and-mortar store and a push cart to 3 Portland stores, as well as locations inside Nike and Intel’s offices in Portland, OMSI Portland, the Moda Center and inside a couple of Portland’s ritziest hotels, prior to expanding their brand to the Larchmont neighborhood of Los Angeles. With famous chef and TV celebrity Andrew Zimmerman having boasted that Salt & Straw has “…some brilliant, brilliant ice cream…every flavor reeks of Portland,” stepping into one of their Portland shops is like taking a culinary food tour around the state of Oregon. I made sure that during our time in Portland we would run into 2 of Salt & Straw’s 3 Portland locations. Our first opportunity came when we dined at Pok Pok in the area known as Restaurant Row on SE Division Street. 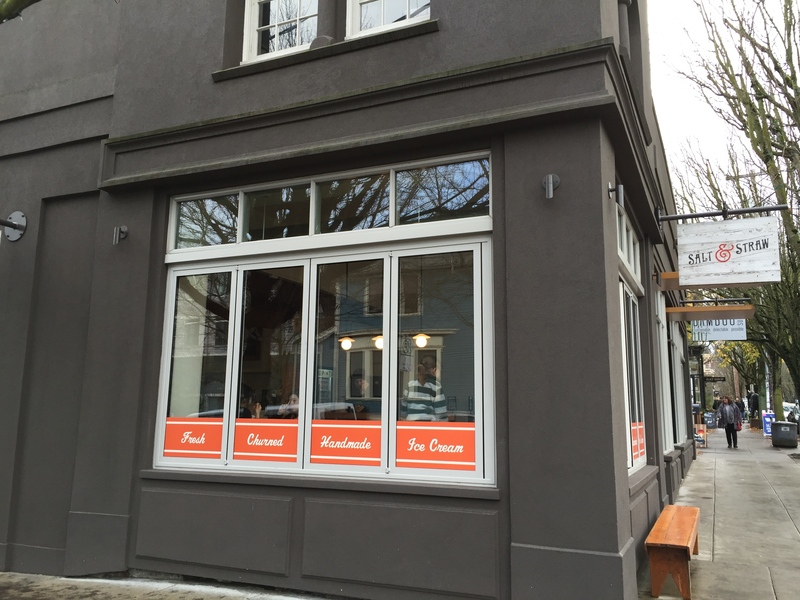 Located just down the block from the hugely popular Pok Pok, Salt & Straw draws quite the nighttime crowd. My husband and I talked about hitting up Salt & Straw after dinner to grab some ice cream to go. Unfortunately, by the time we finished dinner, the temperatures were in the high 40s and we were freezing. When we walked up to Salt & Straw, what had been a decent sized line before dinner had grown to an unbelievably long line that snaked throughout the inside of the store and gushed out onto the street outside of the store. The idea of waiting 30-45 minutes for some ice cream just wasn’t happening that night. Fortunately, on the day we were leaving town, I had planned for us to in one of Portland’s trendier shopping neighborhoods on NW 23rd Avenue. Having been characterized as one of America’s best shopping streets, NW 23rd Avenue boasts a large variety of boutique art, clothing and home decoration stores mixed in with cafes, chocolate shops and restaurants on both sides of the street for blocks and blocks. 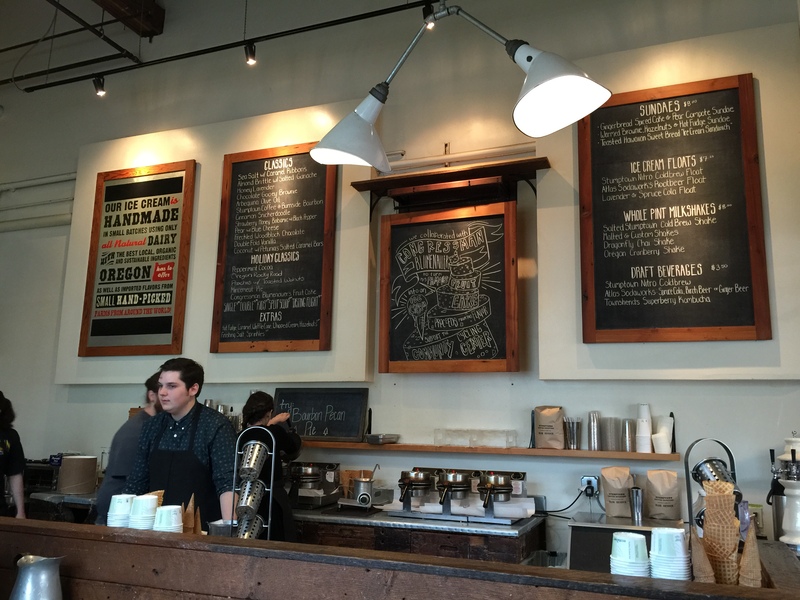 In the heart of NW 23rd Avenue in the historic Esquire Building sits Salt & Straw. With a warm and inviting atmosphere which includes a loft style creamery upstairs where the ice cream is churned, the smell of fresh made waffles wafting in the area, and beautiful bay windows with small seats and tables for guests to dine in, Salt & Straw feels like your neighborhood, old-fashioned ice cream scoop shop. When you step up to the ice cream counter, you see chalkboards with handwritten listings of everything available in the store on that particular day. In fact, one of the boards reads, “our ice cream is handmade in small batches using only all natural dairy with the best local, organic and sustainable ingredients Oregon has to offer as well as imported flavors from small hand-picked farms from around the world!” My husband and I were glad that we waited until our final day to hit up Salt & Straw on a cold, drizzly morning when the ice cream shop wasn’t busy, as opposed to the very busy Friday night stop we could have made after having dined at Pok Pok. 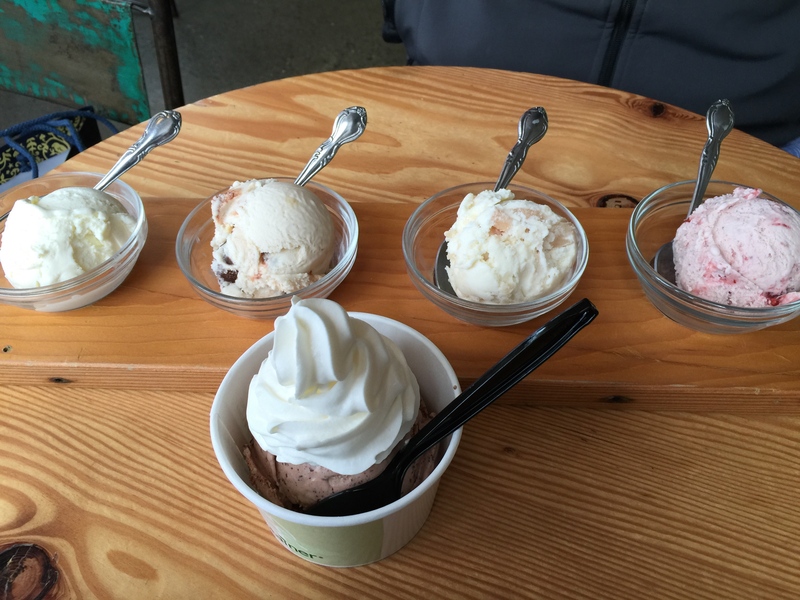 Being unfamiliar with Salt & Straw and what they had to offer, we really needed the time to look over all of the offerings and weigh our options. The people working behind the counter were so incredibly friendly and helpful answering all of our questions and offering numerous samples. They were also very well trained and versed on what all the ingredients in each one of the flavors available were and where the ingredients came from. On top of offering traditional scoops of ice cream, Salt & Straw also offers various sundaes using homemade ingredients and accompaniments, ice cream floats featuring local Stumptown Coffee, Atlas Sodawork’s rootbeer and Lavender & Spruce cola, as well as whole pint milkshakes and draft beverages that again feature Stumptown Nitro Coldbrew coffee and Atlas Sodaworks’ Spruce Cola, Birch Beer and Ginger Beer. 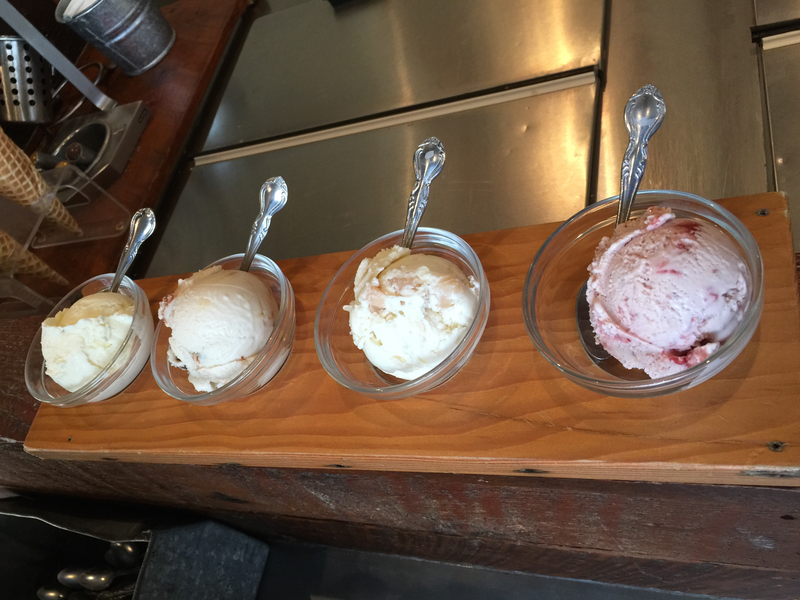 What was interesting to learn about, that I’ve never experienced at any other ice cream shop was the history and story behind the ingredients that go into all of the different ice cream flavors that Salt & Straw churns out. 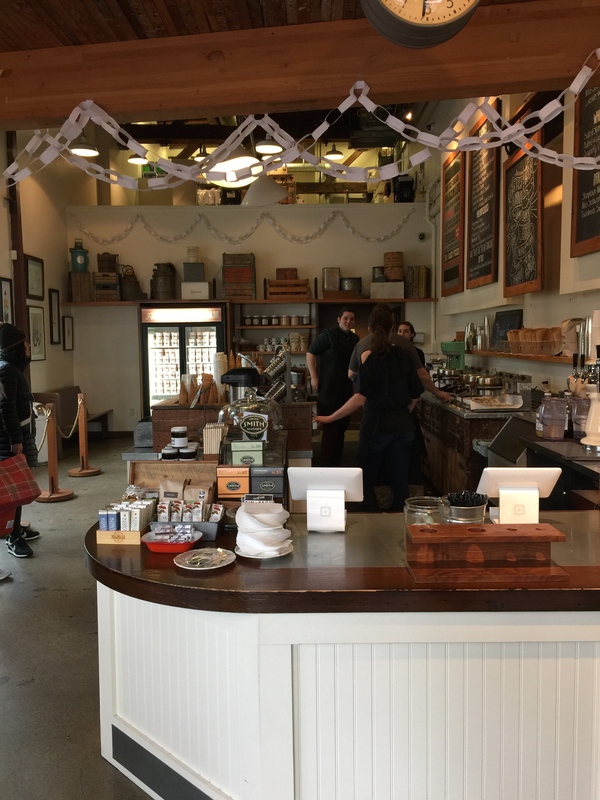 There are some popular and favorite flavors that can always be found at Salt & Straw’s Portland shops and then some additional seasonal flavors that are added depending on what’s available and the time of year. Sea salt with caramel ribbons is a Portland favorite created with the owner of Portland’s internationally renowned salt shop in mind. He has written a James Beard award winning cookbook, and The Meadow’s fleur de sel, made in Guatemala from salt pans that supplied the Mayan Empire, is used in this particular ice cream flavor. Hand-burned caramel, made in store is combined with this amazing fleur de sel to create one of Salt & Straw’s more popular flavors. Also available was Honey Lavender, which is what my co-worker told me was to-die-for, made from Oregon-grown lavender steeped in honey to extract maximum floral flavor. The honey used is from Bee Local honey which harvests their honey from urban hives located throughout Portland creating unique and local flavors that are constantly changing throughout the year. Another flavor on the menu was Stumptown Coffee & Burnside Bourbon made from Stumptown’s single-origin Sumatra coffee combined with Portland’s own HolyKaKow Chocolate and the local Eastside Distillery Burnside Bourbon. Cinnamon Snickerdoodle was also on the menu, using a mixture of snickerdoodle cookie and spicy cinnamon ice cream, both featuring Red Ape Cinnamon out of Eugene, Oregon. Red Ape Cinnamon harvests cinnamon from Sumatra and uses 5% of their profits to donate to non-profit organizations that help save orangutan habitats in Sumatra. You’re beginning to see now how each ice cream flavor has their own story and how it really is a culinary journey of Oregon. Other flavors available the day we visited Salt & Straw included: almond brittle with salted ganache, chocolate gooey brownie, double fold vanilla, peppermint cocoa, Oregon rocky road, peaches with toasted walnuts, mincemeat pie, and Congressman Blumenauer’s fruit cake. Being afraid to be too crazy and step too far outside of my comfort level, I chose a single scoop of the Freckled Woodblock chocolate topped with homemade whipped cream. I was curious as to why it was called “freckled” chocolate and the girl helping us behind the ice cream counter was able to explain the process of making this flavor so precisely that it sounded so intriguing, all while she was luring me in with a visual description of what the ice cream would taste like. 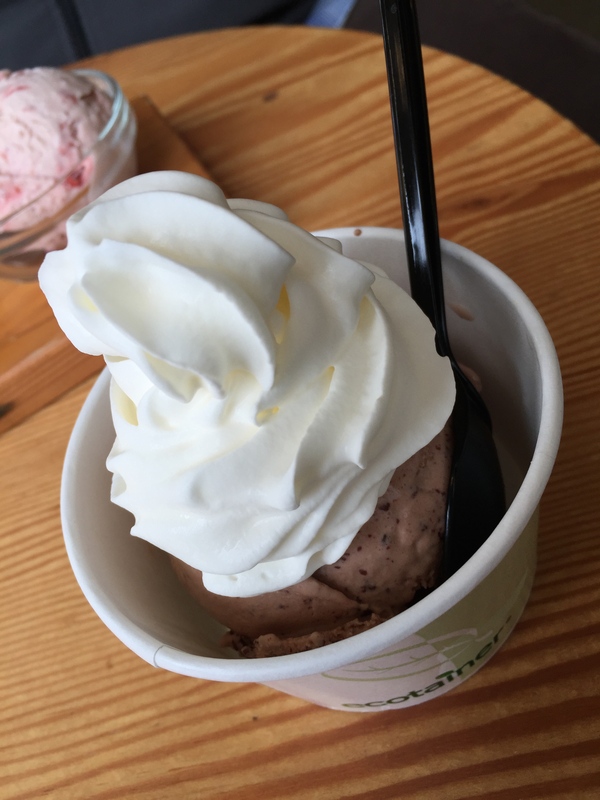 According to Salt & Straw, Freckled Woodblock chocolate is made by, “roasting cocoa beans in a 19th century-old fire roaster, Woodblock was the first bean-to-bar chocolate maker in Portland. We add a bit of Jacobsen sea salt, the first to harvest salt from the Oregon coast in over 200 years, and then use an old-school ice cream making technique called “freckling” to suspend the chocolate in an untempered state.” So, don’t mistake this ice cream for a plain old chocolate ice cream, it has a history and ice cream-making technique which reaches a lot deeper than that. As the girl behind the ice cream counter explained to me, this ice cream taste like chocolate with subtle hints of dark chocolate “freckles” and a bit of salt, just enough to give it a salted chocolate taste. I’m not a huge fan of salty and sweet items together, but in this case, it works with the chocolate as it plays off the chocolate and dark chocolate “freckles” and creates an inviting combination. My husband was intrigued by all of the unique flavors available on the menu and couldn’t decide what to order. Then he saw something on the menu called a “tasting flight” and had to inquire as to what that consisted of. A tasting flight is made up of 4, 2-oz. scoops which allow you to “taste” 4 different flavors. Essentially, it’s the equivalent of a double scoop of ice cream at the shop. Once my husband heard that he could have a 4 flavor sampler, he knew that’s what he wanted. Now he just needed to decide what 4 flavors he would choose. The first flavor that my husband chose was Coconut with Petunia’s Salted Caramel Bars. My husband is a huge fan of coconut-flavored anything, so it’s no surprise that he’d go with the coconut ice cream. This is a coconut based, non-diary ice cream combined with salted caramel bars from Petunia’s Pastries. Petunia’s salted caramel bars are vegan and gluten free. Additionally, hand-burned caramel and house made chocolate ganache are swirled into the ice cream making this ice cream fruity, chocolatey, caramely and slightly salty. I took a spoonful of this ice cream and thought that the coconut ice cream was incredible. Packed full of coconut flavor, it was hard to believe that this was a non-dairy ice cream, you couldn’t even tell. Hands down, the best coconut ice cream I’ve ever tasted. My husband agreed that the coconut flavor in the ice cream was spectacular and a winner at any other ice cream shop. While the ice cream was tasty, my husband didn’t think that the ice cream flavor overall with Petunia’s salted caramel bars was really anything special. There wasn’t any special ingredient in here that he hadn’t tasted before in some sort of combination. And out of the 4 different flavors that he tried, this one stood out the least. Not to say it wasn’t good, but compared to the other three flavors, there was nothing to make it unique and special. The next flavor in his tasting flight was the strawberry honey balsamic with cracked black pepper. I was most excited to try this flavor as I’ve tried to make balsamic glaze as an ice cream topping at home and it just didn’t turn out that terrific. I know that reduced balsamic vinegar with strawberries is a great flavor combination, so I was certain that done correctly in an ice cream format with black pepper would be spectacular. 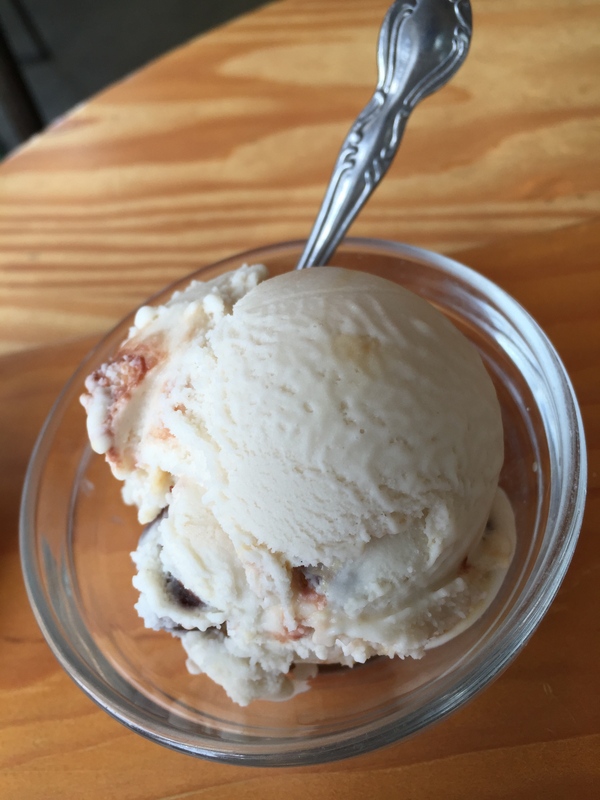 The ice cream is made with strawberries, jam and syrup from Oregon Hills Farms and balsamic vinegar from a 5th generation bee keep at Honeyridge Farms. The cracked black pepper is a trick used to bring out the strawberry flavor in the ice cream. For me, this ice cream was amazing. It had a hint of sweetness from the reduced balsamic, and it had the farm fresh flavor of ripened strawberries, and just the hint of black pepper that really did enhance the strawberry flavor, as advertised. It was just a good combination of flavor components all together and really well-made ice cream. Of the 4 flavors in my husband’s tasting flight, my favorite was the Arbequina olive oil. The ice cream itself didn’t look like anything special, perhaps just like a scoop of vanilla ice cream. But again, what did I expect olive oil ice cream to look like? Made with Arbequina olive oil Red Ridge Farms’ Oregon Olive Mill located in Dundee Hills, the beautiful wine country located just outside of Portland, they were one of the first farms in Oregon to grow, harvest and press olives into olive oil. 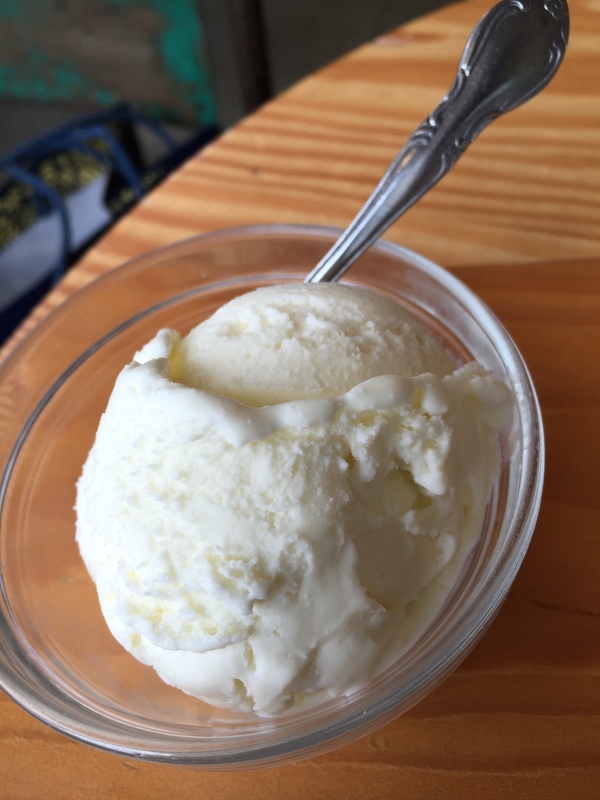 The Arbequina olive oil is described as, “slightly spicy with sweet grass notes and floral undertones.” This particular flavor of ice cream became popular after the famous TV talk show host Oprah named it as one of her favorite things. And one of my favorite things it became. The texture, feel and taste of the ice cream was so smooth and silky. The ice cream has a very smooth, silky feel to it. And you definitely get the hints of floral in the flavor of the ice cream. A spoonful of the ice cream just slides right down your throat and coats it in all this luxurious goodness. One of the best, most unique ice cream flavors I’ve tasted in a long time. Hands down, my husband’s favorite of the 4 flavors is the one he most wanted to try when we stepped into Salt & Straw: pear & blue cheese. Personally, before tasting the ice cream, the combination made me cringe a bit. But then again, I’m not a huge fan of savory flavors in my sweet dessert, so I couldn’t quite fathom how something as pungent as blue cheese with something like pear as an ice cream would work. On a savory dish, I enjoy the combination of pears with Gorgonzola cheese, so I imagined that a pairing with blue cheese would be similar. But that’s a savory dish, like a pizza, not a sweet dish like ice cream. At Salt & Straw, Oregon Trail Northwest Bartlett pears from Salem are paired together with aged Rogue Creamery’s Crater Lake Blue Cheese. This particular cheese was recently named the best in the world at a cheese competition in France. 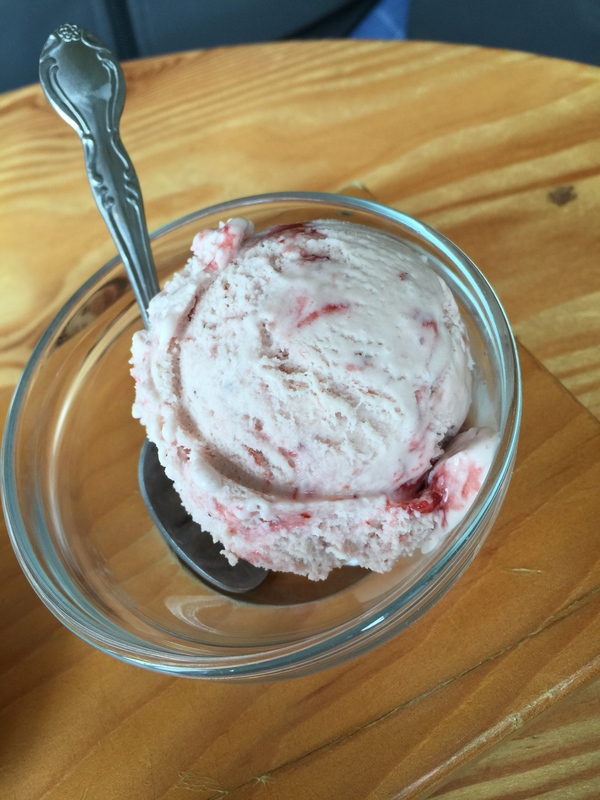 This ice cream combines two of Oregon’s best flavors into a creamy and rich ice cream. And after a tentative taste, I must admit that this pear & blue cheese blew away any of my expectations of how good pear & blue cheese ice cream could be. 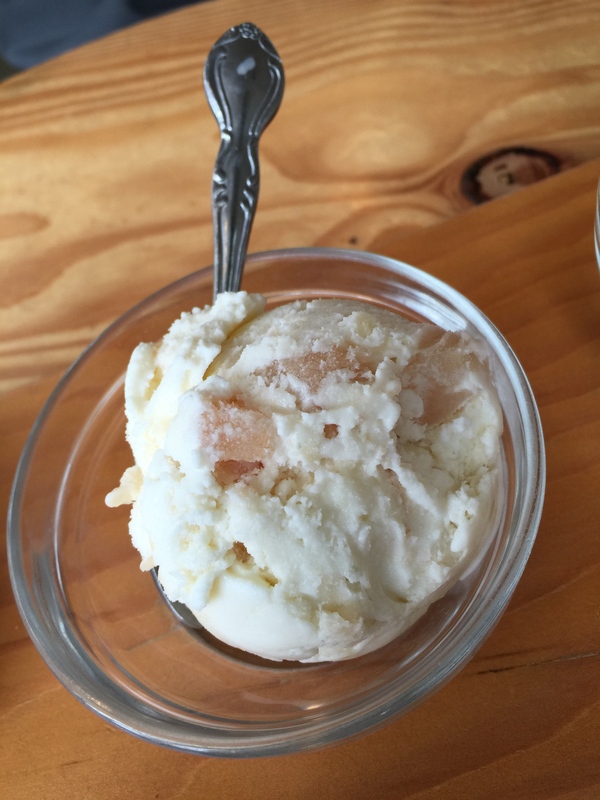 With every bite, you could taste the sweet flavor of the Bartlett pear, and you got a slight undertone of blue cheese, but interspersed in the ice cream were little pockets that had crumbles of actual blue cheese in it and it was like finding a hidden surprise. Those hidden pockets of cheese just burst with flavor and were a perfect compliment to the creamy ice cream and sweet Bartlett pear. It was almost like a perfect match made in heaven of two incredibly strong, but opposite flavors, combining together to form an incredible ice cream. My husband fell in love with the ice cream after the first bite, and still claims to this day that this is the best, and most unique flavor combination in an ice cream he’s ever had. It was just that spectacular. I’m so glad that we made the time to seek out and try Salt & Straw. My husband will tell you that out of all of the ice cream shops I’ve dragged him to over the years, this is easily his favorite. 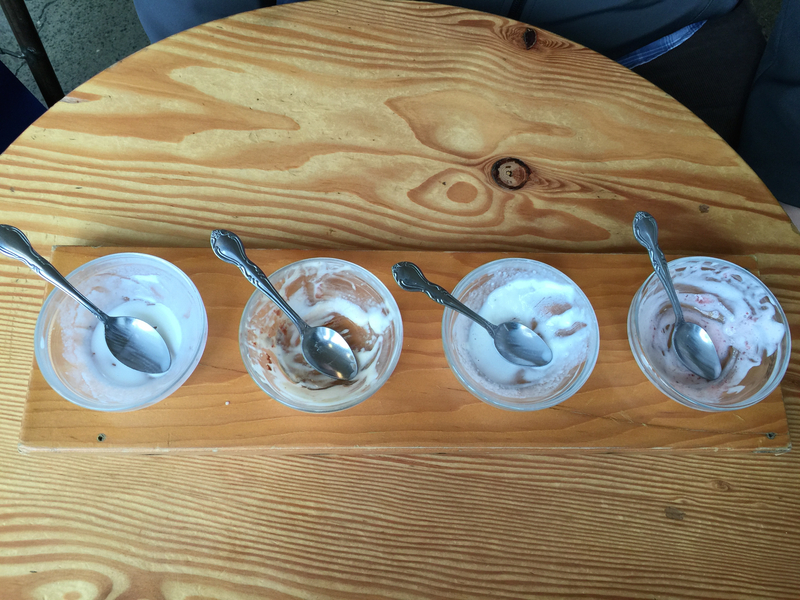 All of the ice creams were obviously made with a lot of thought and care and really represented incredible flavors from all over Oregon. It really was like a culinary tour of the best that Oregon has to offer in ice cream format. Each flavor of ice cream definitely had the hand made, small batch flavor behind it. Each spoonful was packed full of vibrant tastes and flavors and it was obvious the care used to craft each individual batch of ice cream. If I lived in Portland, I think you’d find my husband and I at Salt & Straw multiple times a month, if only to try out all of the new and seasonal flavors. In fact, my coworker who first told me about Salt & Straw lives so close to the new Los Angeles location that she says she’s been there so many times she can’t even count. Looks like I need to visit Salt & Straw Los Angeles before too long to get my Salt & Straw fix.